VAC-U-MAX was founded in 1954 with the world’s first alternative-energy vacuum – one that operated on compressed-air instead of electricity – for safe operation in the textile mill industry of New Jersey. 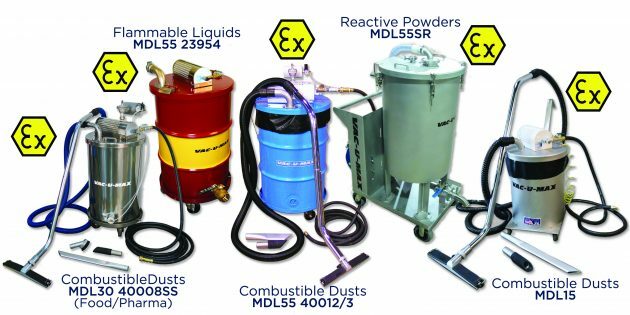 VAC-U-MAX compressed-air-powered industrial vacuum cleaners are ATEX Tested and Certified, including the CD Series for Combustible Dusts, FL Series for Flammable Liquids and the SR Series Submerged Recovery Systems for applications such as reactive metal powders used in AM /3D printing and explosives used in ordnance production. The ATEX directive consists of two EU directives describing what equipment and work space is allowed in an environment with an explosive atmosphere. ATEX Certification requires a third-party review and full testing, not just design paperwork, and where UL standards exist, ATEX certification becomes very important as UL does not have a standard for non-electrical equipment in explosion-hazard environments.